Microsoft announced it was cutting off Cuba from its instant messaging service in order to be in compliance with U.S. law. This is really an important step forward for democracy in Cuba, because it is well known that the opposition can organize more easily if it cannot communicate. Everyone also knows that the best way to generate good will toward the United States is to cut people off from chatting with their friends and family. "They don't want to discuss, what they want is a show." For anyone interested in immigration issues, check out Franco Ordoñez's blog This Land. Franco is a reporter for the Charlotte Observer. I've had numerous students who served in Iraq and Afghanistan. Now one is gone. 1st Lt. Leevi Khole Barnard was killed in Baghdad. He took my Latin American Politics class several years ago, and graduate with a degree in Political Science. "Sad" is the word that keeps coming to my mind, but it doesn't do this justice. I guess nothing really can. Lawrence Harrison, who working with the late Samuel Huntington has written a lot about how Latin American culture is the root of all its problems, has an op-ed in the Christian Science Monitor. The upshot is that we need to stop allowing Latin Americans (doesn't matter from where--they're all the same) into the country, because they bring their terrible culture with them. This "cultural problem" (his words) explains everything--not only why there are coups in Latin America, but also why there are Hispanic drop-outs in the United States. Strangely enough, this is the second day in a row someone has complained about the Spanish language. For Harrison, it shows how Latin Americans don't understand accountability--the verb structures prove that. So, what is the solution? In part, censorship. Among other things, we should "discourage the proliferation of Spanish- language media." Be sure to check out Robert Funk's blog on Chilean politics. He is a political science professor and Academic Director at the University of Chile's Institute for Public Affairs. You know it has to be good when the latest blog post is entitled "OUT-FRIGGIN-RAGEOUS." Of all the conservative reactions to the Sonia Sotomayor nomination, Mark Krikorian from the restrictionist Center for Immigration Studies takes the cake thus far. It "sticks in his craw" that people would pronounce her name properly in Spanish, which he says is "unnatural." He also does not like the fact that Spanish has gender specificity. Since English doesn't have it, then Spanish shouldn't either. You may think I am making this up, but I promise I am not. These aren't exactly what I would have expected. I know Argentina is an economic basket case, but how did Paraguay garner the number two spot on the other end? I would not have thought Guatemala or Honduras were under the Latin American average either. The good news is that these numbers have dropped substantially over the past four years, in every country but Mexico, where they have remained constant (but still relatively low). Oh, and while we're on the subject of economic basket cases. The Obama administration's own projections have U.S. public debt at 100% of GDP by 2010. Maybe we need to go learn from the Paraguayans. I've been asked about the Sonia Sotomayor nomination, and am really overdue in discussing the political implications. I will leave the issue of her qualifications to those more qualified. this nails Republicans, who cannot oppose her much without alienating the Latino population. Every criticism or derogatory reference to affirmative action or lack of intellectual heft will be replayed in the next election. it helps solidify the Democratic Party's attraction for Latinos. there has been conflict at times between African Americans and Latinos, and I think there is symbolic importance to an African American president naming a Latina to the Supreme Court. I wouldn't want to make too much of it, but it is relevant. this gives Obama breathing room on immigration reform, and thereby greatly decreases the chances of a reform proposal before the end of the year. Unless something dramatic happens (e.g. a hitherto unknown scandal about her) it is hard to see anything but approval. I mentioned about a week ago that Eduardo Frei compelled to remind Chileans that he is the Concertación's presidential candidate. Unfortunately for him, dissatisfaction with his candidacy is gaining more media attention. And really, you have serious problems when you attempt to change your boring image by taking off your tie and--I am not making this up--giving up hair gel. So the rumors are flying about replacing Frei. Boz mentions Marco Enriquez-Ominami, a young Socialist diputado, but the most common name thrown around is Andrés Velasco, Bachelet's Finance Minister (see Patricio Navia on Velasco). Yesterday I wrote about how Iran's presence in Latin America was being criticized within Iran. Now the Israelis say that Venezuela and Bolivia have been providing uranium to Iran for its nuclear program. This comes on the heels of a February report from the IAEA that Iran had more uranium than it had previously revealed. There has yet been no official response from Venezuela or Bolivia, but there are two general possible retorts: either "this is a lie" or "yes, we are, and we can do what we want." This will likely put Obama in a very tough spot. First there was the famous Chávez handshake, and Tom Shannon just went to Bolivia to start patching things up. If the allegations are true, then all the niceties will end, and the Republicans will talk nonstop about Obama's naivete. Actually, the latter will happen even if the allegations are denied. Update: Matthew Yglesia's take on whether Iran is even trying to build a bomb at all. Independent Mir-Hossein Moussavi, who is slated to try his luck against Ahmadinejad in the June 12 elections, accused the Iranian President of making foreign policy moves that have “isolated” and “disgraced” Iranians in the international arena. “Instead of investing in Iran's neighboring countries, the government has fixed eyes and poured money into Latin American states. The President has obviously failed to get his priorities right," said Moussavi in his first televised speech. This has become a common criticism. Certainly, Iran's presence in Latin America annoys the United States, but that does not advance Iranian interests. In many ways, it does the opposite, by making the U.S. even more antagonistic than it needs to be. It took how long to figure this out? Juan Forero at the Washington Post has a story about a radical new solution to drug trafficking in Colombia. It's called......infrastructure! The plan underway here is an ambitious state-building effort designed to incorporate a once-forgotten region into the legitimate economy by bringing in police and courts, paving roads, improving schools and offering farm aid. The idea is to provide broad incentives for farmers in this town in the southern state of Meta to stay put and grow legal crops. That's just crazy. Next thing you know they'll be talking about rule of law. Last month Alvaro Uribe said he was trying to convince his own soul not to run for a third term. Now he says it would be "inconvenient" and that he's "afraid" of keeping a president in power ("Tengo temores. Le temo a perpetuar al Presidente"). He said he also does not want future generations seeing him as someone who wanted to stay in power. Inconvenient? Yes, especially for your former defense minister, who quit his job because he wants yours, but you won't tell him what you're doing. But now, Uribe says, he is at a "crossroads of the soul." So what does all this mean? Actually, not much. He made sure not to rule out running again. In fact, the same El Tiempo article notes that his aides hastened to explain that these statements did not mean any sort of decision. I tend to think he's telling the truth--he wants to run again really, really bad and knows he would win. But he really, really does not want to end up compared to Hugo Chávez. Call me a sentimental sap, but I like the Jody Gerut for Tony Gwynn Jr. trade that just went down. Baseball Prospectus 2009 says "He's fifth outfielder material" and "let's face it, if his name were Tony Jones, he'd hardly be worth a second look." Probably true, as his MLB numbers are underwhelming and he's already 26. But the Padres are in rebuilding mode, so give him a chance. From a bottom line perspective, he is also a cheap way to possible generate a little more fan interest. You should definitely check out Lars Schoultz's That Infernal Little Cuban Republic: The United States and the Cuban Revolution (2009). (Lars was my dissertation advisor and remains a good friend, so you can take that bias as you will). At 745 pages it is a doorstop of a book, but well worth it. For those who have read his Beneath the United States, you will recognize the method. He has sat down in a number of different archives, read virtually everything U.S. policy makers had to say about Cuba, and then let them speak for themselves. Cuban archives are not open, but he uses Fidel Castro's speeches and even interviews (such as Ricardo Alarcón) to highlight the Cuban responses. Meanwhile, he pays very close attention to detail (there are 158 pages of notes) so that all the specifics of each crisis and/or policy are made clear. All the while, it is an entertaining read. The central theme is power, and its punitive uses. LBJ once said, "We ought to pinch their nuts more than we're doing." Nut-pinching has been U.S. policy ever since (p. 5). Along with that, though, come countless examples of insanity. We can talk about the Cold War, or the influence of Miami, etc. but in many ways it comes down to policies that are truly unhinged and divorced from reality. During the JFK years, the State Department said why not "take advantage of Castro's vanity, accuse him of sporting a beard simply because he has no chin. His proprietor Khrushchev needs no beard, dare his vassal to be man enough to shave" (p. 199). Senator Jesse Helms claimed that Wall Street was part of a plot with the Soviets to create a socialist world order (p. 477). Otto Reich compared the Baltimore Orioles baseball game in 1999 to the 1936 Berlin Olympics (p. 502), which of course was followed by a Hitler reference--a comparison to Hitler (usually accompanied by a Chamberlain reference to emphasize appeasement) has been a stock response to anything about Castro. He also notes that the Helms-Burton law was the very first law to begin with a list of "findings," 28 in all. He adds dryly that "The closest historical parallel is the Declaration of Independence list of grievances against King George III, and his indictment was limited to only eighteen transgressions" (p. 484). Cuba, it seems, is worse even than our former colonial rulers. It is sprinkled throughout with humor. One of my favorites was how the Bush administration's funding of USAID was "Hogs at the Trough Day" (p. 546). But there is also the idea that Cubans might want "a type of democracy that would seem strange to U.S. citizens--perhaps one where the popular vote determines who becomes president" (p. 566). when it comes to Cuba, U.S. officials have always seemed to assume that they can do more or less what global opinion will tolerate, and sometimes a bit more, especially if they insist, as Teddy Roosevelt did in 1907, that he was only trying to make Cubans good, or, as President George W. Bush did in 2008, that the United States sought only to help Cubans enjoy "the blessings of liberty" (p. 554). And, finally, not too much has changed since 1901, when Governor-General Leonard Wood said, "No one wants more than I a good and stable government, of and by the people here, but we must see that the right class are in office" (p. 556). After more than a century, we still pursue delusional policies while claiming the moral high ground. Eduardo Frei, who became the Concertación presidential candidate last month, is so boring that he feels compelled to affirm that his campaign has actually started even though no one has noticed. Next thing you know, he will have to start reminding people he actually used to be president. The Chilean opposition has once again blocked a proposal to reform Chile's binomial electoral system, and so the Concertación is trying to lay the blame on presidential candidate Sebastián Piñera, who has said he supports the reform. The binomial system is a legacy of the dictatorship and has been a bone of contention for years. Congressional districts have two members. Parties (or coalitions) can put up two candidates per district, but to get both seats a party must win over 2/3 of the total district vote. If they win less than that, then the party with the second most votes gets the second seat. The intent was to protect the political right and ensure it would keep winning seats despite its relatively small size. Since 1990, there have been many studies of its effects. * For example, it can foster party cooperation (because larger coalitions have a better chance at winning both seats) but it also means that party elites carefully pick and choose who should be in a given district, putting the entire process in the hands of only a few party leaders. Further, it shuts out small parties that do not join coalitions. But the parties of the right have now guaranteed that can continue to analyze the binomial system and suggest reforms for the foreseeable future. * Peter Siavelis has been writing about this for years--for an analysis plus suggestions of reform, check out his "Electoral Reform Doesn't Matter-or Does It? A Moderate Proportional Representation System for Chile." Revsita de Ciencia Política 26, 1 (2006): 216-225. Patricio Navia has also published a lot on the binomial system--see here for a paper on candidate selection. Maibe González at Feet in 2 Worlds notes an unusual phenomenon--reverse remittances from the Dominican Republic. In other words, immigrants in the United States getting money from their relatives back home. This is a very uncommon situation, because you have to be rich. That is the case of Ana Isabel Rodríguez, a Dominican immigrant who lives in Manhattan. She lost her job as a sales person for a major cosmetics firm last November. Now she is living off the rent of her beach house in Puerto Plata in the Dominican Republic. “I didn’t want to rent the apartment, but that’s my only source of income now,” she said. So I don't expect this to be a widespread issue anytime soon. Now even The Economist is on board criticizing Alvaro Uribe for pushing for a third term in office, going so far as to use the word "autocracy" in the title of the article. It does a very good job of summarizing the problems Uribe has (particularly with regard to human rights) and the arguments being made against reforming the constitution to run again. It's been a long fall for Uribe, who used to be a U.S. media darling but now is getting zapped more often--the Washington Post gets into all the details of the latest spying case, and even very short AP articles include mention of human rights abuses. Despite collapsing job markets in construction and other low-wage work, there has been no exodus among Mexicans living in the United States, the Mexican census figures show. About the same number of migrants — 450,000 — returned to Mexico in 2008 as in 2007. Actually, as the article points out, the evidence suggests that you cannot reverse the flow (or at least we haven't) and that more people will not go home. As of now, Venezuela is still not a full member of Mercosur because that requires approval from both the Brazilian and Paraguayan legislatures. Earlier this year, Lula predicted that Brazil would approve by March 2009, which did not happen. In anticipation of the Mercosur summit, Fernando Lugo is again saying he wants approval, but he doesn't have the necessary votes in the senate. With his paternity claims and now even a traffic ticket, I have to wonder where he's going to get the political capital he needs. On a side note, way back in July 2007 Hugo Chávez said that if Venezuela didn't get approval within a few months, he would withdraw the candidacy. That didn't happen either. 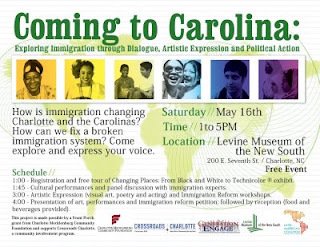 For anyone interested, I will be participating in an event on Saturday about immigration to the Carolinas at the Levine Museum of the New South, co-sponsored by the Latin American Coalition. Joining Ernesto Zedillo (and other former Latin American presidents), Vicente Fox has called for the legalization of marijuana to reduce drug-related violence. This is an interesting development for several reasons. First, it represents a consistent and high-level rejection of the U.S.-led militarized response to the drug war. This sort of public response is a new phenomenon (like the vocal Mexican response to building the border wall). Second, it represents a public agreement between presidents of both the PRI and the PAN, though they did not give a joint announcement (sorry, couldn't resist the pun). These are not natural allies, nor would anyone call them soft on crime. Third, it continues the pattern of former Mexican presidents remaining in the public eye, as opposed to the traditional model of exerting influence behind the scenes. The director of Radio Nacional de Venezuela says that the reporting of some opposition media actually makes Venezuelans psychotic. “These companies are affecting Venezuelans public health. There are psychological studies showing that the manipulation of such companies have generated psychotic dissociations on users,” Salcedo said. That must be some reporting. Is this like the video games that come with warnings that they can cause convulsions in children? The AP has a good summary of the process Alvaro Uribe would have to follow in order to pursue a constitutional amendment to allow him to run for a third consecutive term. The Colombian Congress may start that process today. After congressional approval, the plebiscite must be ratified by Colombia's Constitutional Court. That could take three months. A full 25 percent of Colombia's registered voters would then have to vote to amend the constitution to allow re-election. That's 7.2 million votes. Uribe got 7.5 million in his 2006 re-election. The article also notes that many of Uribe's political allies do not like the idea, which has been obvious for the past year or so. In part, they see similar efforts by Hugo Chávez, Rafael Correa, and Evo Morales as power grabs, and do not want the same for Colombia. (And, of course, remember that Uribe already did this once before). Yet one thing that sets Uribe apart is that even while he pursues that power, he refuses to acknowledge that he is doing it. When asked by the BBC, he answered "Another question, amigo." So what's worse: pushing to stay in office, or doing so while pretending you're not? These polls are so common that they are not really news anymore, but a new Ipsos poll shows that 67 percent of Americans support a policy allowing travel to Cuba. To get a different result, you would have to phrase the question as something like, "Would you support travel to hellish Cuba, where chances are high you would be sacrificed by blood-crazed Marxists?" Andrew Whelan at the AP has a very interesting article about the cocaine boom in Peru and its relationship to the revitalized Shining Path. One question is whether the current version of SP bears any resemblance to the 1980s, and the answer seems to be no. Under Abimael Guzmán, it had a fanatical, utterly insane, but ultimately clearly articulated ideology that mostly involved trying to kill everyone. Nowaways the SP eschews killing civilians, and focuses primarily on drug trafficking while sprinkling in some lectures to peasants about how the government does nothing for the rural poor (which they have long known). But even Peruvian government officials openly say that the SP is thriving because Lima doesn't care about what happens in rural areas. Most peasants don't care about ideology, but SP helps them set up a coca farm, which generates far more income than anything else. The military alone can't defeat the insurgents, say officials in the region. They say the bureaucracy that has hindered development must be surmounted. That nicely sums up one of the problems with the "drug war" across Latin America. The Obama administration has increased the budget for E-Verify, the database of social security numbers, by 12 percent, or $112 million. I think E-Verify could potentially be an effective aspect of enforcement, but for now I have two main concerns. First, it has glitches. For example, about 10 percent of foreign-born citizens get flagged, then must go through the hassle of proving to the government that they're in the country legally. In 2008, about 3.5 percent of all queries were deemed to be mismatches, and no one knows whether they were truly in the country illegally or if they got screwed. Refusal to acknowledge its bugs tends to make supporters view it as a magic bullet. This neat online system will deter people from seeking jobs and therefore they won't cross the border in the first place. It is tempting to think in such simplistic terms. Second, it has to be accompanied by immigration reform, which will then regulates the proper number of workers in the country (even in a recession). We should all know by now that enforcement alone does not work. --"The U.S. policy of isolating Cuba has been a failure"
--"Our Cuban policy is increasingly out of step with the rest of the world"
--"our embargo policy is not working in our best interests"
--"it doesn't make much sense to forego a market a few miles off our shore"
Actually, these are all from 1974. The more things change, the more they stay the same. But momentum (even grudgingly accepted by Henry Kissinger) foundered as both sides accused the other of making excessive demands, and then Cuba vocally supported Puerto Rican independence and became involved in Angola, which the Ford administration decided was too much. *Lars Schoultz, That Infernal Little Cuban Republic (Chapel Hill: University of North Carolina Press, 2009): 266-267. Adimark's most recent poll has Michelle Bachelet at 67 percent. That is higher than any of her predecessors since 1990. It is so high that RN diputado Lily Pérez actually said she was glad Bachelet could not run for re-election. In general, the worse the economy gets, the more Chileans like her. Many feel that her stimulus policies have helped cushion the country from the economic crisis--this may well have heled shift attention away from the strikes and demonstrations that have plagued her term in office. Former Peruvian President Alejandro Toledo is talking openly about about running again in 2011. Next door in Chile, Eduardo Frei is doing the same. Lucio Gutiérrez just tried and failed in Ecuador. [The constitution] created the figure of the great caudillo waiting for the chance to make a comeback. Thus, former leaders do not disappear, but grow weak and then reappear. Martín Tanaka, “From Crisis to Collapse of the Party Systems and Dilemmas of Democratic Representation: Peru and Venezuela.” In Scott Mainwaring, Ana María Bejarano, and Eduardo Pizarro Leongómez (eds.). The Crisis of Democratic Representation in the Andes (Stanford: Stanford University Press, 2006): 56. Iranian President Ahmadinejad is postponing his trip to Latin America with no explanation. I've seen "indefinitely" but I don't know if that is verified. I've argued before that his trips to Latin America (not to mention his promises of aid) are not terribly popular in Iran. Especially in terms of security, Latin America doesn't have much to offer Iran, so it would be logical for Iranians to ask why he is spending time there. For all his talk (and for all the media hype in the United States), Hugo Chávez can't help Iran much. Right now, Supreme Leader Ayatollah Ali Khamanei is slapping Ahmadinejad down in other policy areas. I can't help but think this is all connected and therefore part of the answer. I'm very happy to announce that the book manuscript I co-edited with my colleague Silvia Borzutzky at Carnegie Mellon University will be coming out next year with University Press of Florida. The Bachelet Government: Conflict and Consensus in Post-Pinochet Chile takes a look at a variety of different policy areas, focusing on Bachelet's struggle to reconcile existing elite political consensus with increased social demands. This came out of a LASA panel Silvia and I did in 2007, and we have a great group of contributors. I keep forgetting to link to a post by Rogelio Aranda at the Charlotte Observer's Spanish-language blog. He recalls and has links to 2001, when Hugo Chávez accepted an invitation to visit Hickory, NC. The host was Cass Ballenger, a Republican member of Congress who was, to put it mildly, very conservative. Not just handshakes either--they had a great time, with baseball and southern barbecue. So are the rich making a comeback? Multimillionaire Ricardo Martinelli won the presidency in Panama. Meanwhile, Sebastián Piñera, who is worth $1.3 billion, is currently the favorite to win the December election in Chile. In El Salvador, where the FMLN achieved the presidency for the first time ever, ARENA is trying to regroup by naming former president and very rich businessman Alfredo Cristiani as its new leader. Like a counter-counter-counter revolution. Secretary of State Hillary Clinton, May 2, 2009: "Clinton said that the growing influence from China and Iran in Latin America is 'quite disturbing. They are building very strong economic and political connections with a lot of these leaders. I don't think that's in our interest.'" Deputy Secretary of State James Steinberg, April 1, 2009: "We will work with the Beijing leadership to build a positive, cooperative and comprehensive U.S.-China relationship for the 21st century. That’s why just a few hours ago, President Obama and President Hu announced the launch of our Strategic and Economic Dialogue headed by Secretaries Clinton and Geithner on our side, and State Councilor Dai Bingguo and Vice Premier Wang Qishan on the Chinese side. This high-level Dialogue will serve to coordinate our policies and seek to solve regional and global problems." Lou Pérez, a history professor at UNC Chapel Hill, has probably written more on Cuba than anyone outside of Cuba. He published an op-ed today about ending the embargo. Policy approaches often change, to be sure, but assumptions rarely do, and with Cuba they never do. Obama's “new beginning” possesses a wearisome familiarity: the United States as self-appointed arbiter professing to act on behalf of the well-being of the Cuban people, to bestow upon the Cubans the liberty they are apparently unable to achieve for themselves. "Wearisome familiarity" is a great phrase. The State Department just released the latest Country Reports on Terrorism. For Latin America there is nothing terribly exciting. Cuba remains on the list of state sponsors of terrorism, but I did a double take as I read the fairly short analysis about why it is on the list. --"Cuba no longer actively supports armed struggle in Latin America and other parts of the world"
--"former Cuban President Fidel Castro called on the FARC to release the hostages they were holding without preconditions. He has also condemned the FARC's mistreatment of captives and of their abduction of civilian politicians who had no role in the armed conflict." --"The United States has no evidence of terrorist-related money laundering or terrorist financing activities in Cuba"
--"In keeping with its public declaration, the government has not provided safe haven to any new U.S. fugitives wanted for terrorism since 2006"
In terms of the Obama administration's policies toward Latin America, everyone is focusing on Venezuela and Cuba. Yet despite all the hand wringing about handshakes, the administration's most substantive work is actually a continuation of Bush administration policies--free trade agreements. The U.S. Trade Representative is meeting with Colombian officials to hammer out a deal that might get sent to Congress this year. This is almost completely under the popular radar at the moment, which probably will increase its chances at success. The Bush administration was bombastic, soaking the country with op-eds spelling out apocalyptic scenarios if the FTA did not pass. That approach helped doom the entire effort. On Colombia, Kirk will address concerns over the murder of labor leaders by showing that the country is arresting, convicting, and imprisoning those responsible, said Bill Reinsch, president of the National Foreign Trade Council. We'll see how that goes. Can he actually be BFF with both Chávez and Uribe?